We have now enjoyed a few meals at Symposium Cafe Restaurant & Lounge, Georgetown location. A moderate size place, the atmosphere is nice, good food and good service. The moderate size makes it possible to easily carry a conversation. There’s a few TV screens around the bar showing sports. There’s a nice showcase displaying the desserts. In addition to men’s and women’s washrooms by the entrance they also have a restroom off the dining area for disabled and family use. We thought this is great as we have an elderly family member who can no longer see and has difficulties walking far. Last evening for dinner was another nice experience. After a warm welcome at the door we were led to our table. The host as well as our waitress covered the specials with us. After a few minutes I decided to try the Pork Tenderloin off their Canada Day Specials menu. 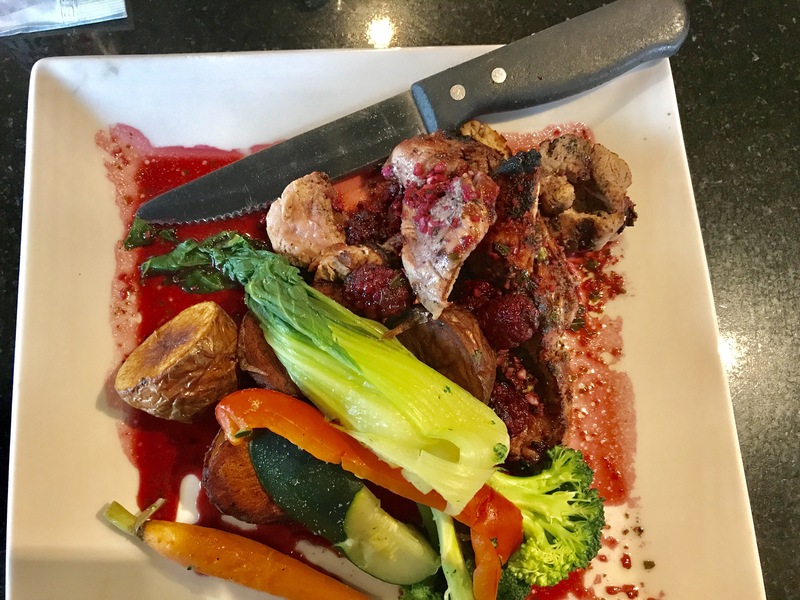 It was served with potatoes and vegetables topped with a raspberry based sauce. The pork tenderloin was nicely grilled and tender. Over all a very nice meal. 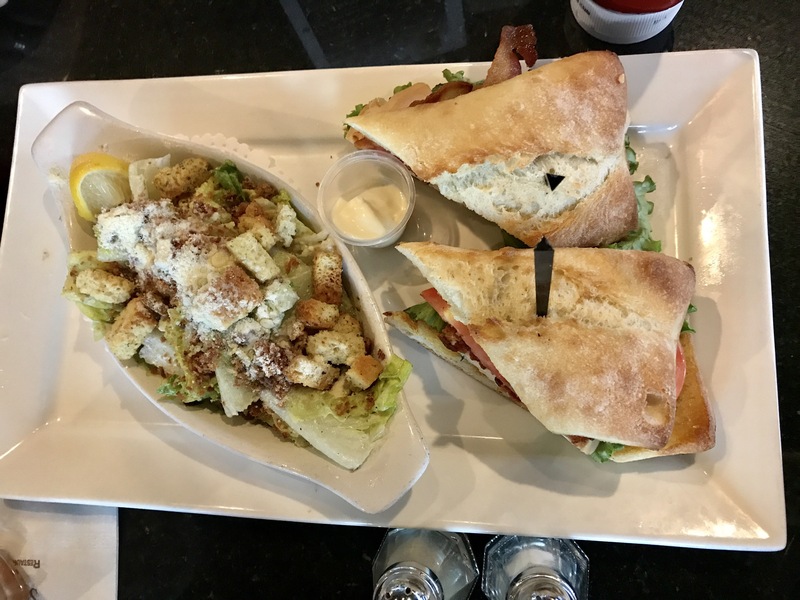 Deniz tried the Turkey Bacon Club with a side Ceasar salad. She had hoped the meat was actual turkey slices but appeared to be deli cuts. That would be her only disappointment but said everything was good otherwise. Overall we have enjoyed our meals here and recommend Symposium Cafe. Always a warm welcome at the door. The servers are friendly. But what impressed the most was the host coming by our table mid way through our dinner to make sure everything was fine. His demeanor was very polite and warm as well. Not just a quick “everything ok?”. On our last visit the host and another gentleman came by our table. This is in addition to our server coming by periodically as well. We felt it was nice to see them put extra attention towards ensuring their customers were enjoying their experience there. We also felt it was not too much either. It did not feel they were constantly interrupting us. But in a day where customer service is sliding in general, this was nice. Hopefully they are consistent like this across their other locations.